1. Kiehl’s Vital Sun Protection Lotion SPF 30, $19.50. It’s hard enough to find a sunscreen that’s not sticky, and won’t irritate skin. The best part about this sunscreen from Kiehl’s is that it’s super lightweight and moisturizing (it has skin-loving ingredients like aloe, vitamin E and soybean oil). If you’re on the drier side, you’ll love it too. I wouldn’t recommend if you have already oily skin, but if you’re going to be in the water, this will protect you for a good 80 minutes before you need to re-apply. 2. Clarks Botanicals Anti Puff Eye Cream, $87. I recently wrote about this in a round-up of awesome gifts for your guy, but don’t get it twisted — it can work just as well for you. I’m actually pretty sensitive to eye creams (I’ve had a few next-morning-puffy-eye mishaps), but this one is so gentle and contains skin-firming ingredients and botanicals, including skin lightening vitamin K.
3. Becca Shimmering Skin Perfector in Opal, $41. I just recently got an up-close look at the whole Becca line, which is amazing for women with darker skin tones because they have the most shades of tans and browns in their color foundation collection and difference variants in coverage. But after achieving more even skin with these brightening products (which are doing wonders for me so far), I’ve turned to Becca’s Shimmering Skin Perfector for even more glisten (day or night!). Dab this on your cheekbones and brow bones for a very natural, dewy sheen that’s just blends in beautifully. It doesn’t look like any makeup but some extra oomph when light hits these light spots. No disco balls here — just a lovely, pearlized finish. I just use my finger to dab it on. It’s $41 but it will last you approximately forever. Even one pump is too much for one use — I try to do half a pump to cover just the high points of my face. I use it in Opal which compliments my skin tone the best. Check out this YouTube video from Lisa Eldridge to see exactly what I’m talking about. Plus it has SPF 25 that helps protect against 97% of UVA/UVB rays and also has anti-inflammatory ingredients/antioxidants like vitamins A, B, D, E. Tip: Use a setting/mattifying powder on your T-Zone to keep the focus on your cheek and brow bones. 4. Sebastian Potion 9, $16. Not sure what took me so long to discover this, but it contains a magical mix of 9 botanicals that softens and smoothes my frayed ends and add a gorgeous coat of shine. Just use a little on wet hair and blow dry. Ever more essential to keep frizz at bay during these more humid times in NYC. 5. 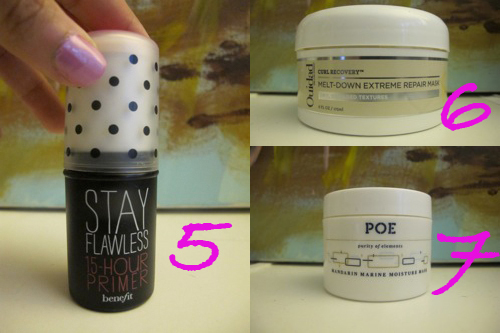 Benefit Stay Flawless 15-Hour Primer, $32. I’ve all but written most primers off, until this got sent my way. It’s a paraben-free twist up stick that you can easy apply right after sunscreen (at least that’s how I use it) over my T-Zone and cheeks before applying foundation. I found a couple things using this: (1) I use less of my foundation when I use this, since it helps the color stick to my skin; (2) it doesn’t cake up and helps mattify areas where I apply it; (3) no touch ups needed; (4) it keeps my makeup in place so it doesn’t rub off on my clothes or collars. It definitely lives up to its promise to keep your makeup going and going. 6. Ouidad Curl Recovery Melt-Down Extreme Repair Mask, $40 . I don’t have curly hair, but I loveee using products recommended for curly hair types because it’s heavy-duty with its moisturizing properties. This one from Ouidad smells like heaven, and has nutrient-rich ingredients like mafura butter and kalahari melon seed oil. Whenever my hair is looking dull, I’ll use this to help rebuild every strand with its chock full of fatty acids and helps protect from more damage. I’ve been using it weekly for shiny locks. 7. Poe Mandarin Marine Moisture Mask, $52. Sometimes I come across products purely by accident, and this was one of those things I picked up at work and just thought I’ll try it — why not? Whenever I’m feeling like my skin is getting more sallow, I’ll use this as a quick pick me up. They describe it as a ‘tall glass of water for your skin,” and that’s exactly how it feels. It has skin plumping hyaluronic acid, and hydrating algae extract and anti-inflammatory ginger root infused in a clear jelly consistency. A nice dose of antioxidants (vitamin C!) that help rebuild collagen. It’s a light mask but it can tingle just the tiniest bit so I’m not very keen on recommending for for super sensitive skin types. Mine is a bit combo and can handle this once a week. If you’re on the drier side and don’t have sensitive skin, give this one a shot. 8. Caress Fine Fragrance Elixirs Body Wash in Tempting Whisper, $5. When it comes to scents, I can be kind of OCD about layering them and it starts right in the shower. This one is like taking a bath in perfume — wild peony and red plum that smells like a $50 fragrance for only $5. Just don’t blame me when you find yourself taking longer showers because of it. 9. Crown Brushes, $10 and up. I whole-heartedly believe your makeup is only as good as your tools — in this case, brushes. I’m in love with this brand which makes professional-grade brushes at a fraction of the price ($10 currently another 10% off your order? WT&!@#). This double-ended foundation brush and small kabuki brush blends my makeup base on with no trace of bristles left behind on my face (a more common problem then you’d guess), and feels ultra soft against skin. 10. Lumene Complete Rewind Intensive Repair Day Cream SPF 15, $30. I’m all over the anti-aging game, and I learned so much about this line specifically recently (sold at cvs.com, and dermstore.com). So the deal with these products sourced in Finland is they’re a prestige line overseas that have come here at a much more affordable price. This line specifically uses anti-glycation technology (sugars break down skin’s collagen and this fights against it), plus it contains ingredients like the Arctic’s most resilient plants (sea buckthorn for its anti-oxidant properties) and fatty acids like omegas 3, 6, and the rare omega-7 to keep skin firm and bright. I’ve been using this day time cream for weeks and my skin is thanking me in return with soft, soft skin (also thanks to olive oil and shea butter). The only thing is this won’t be available until August for consumers (sorry guys, I hate me too when I do this, but keep a lookout for it!). 11. 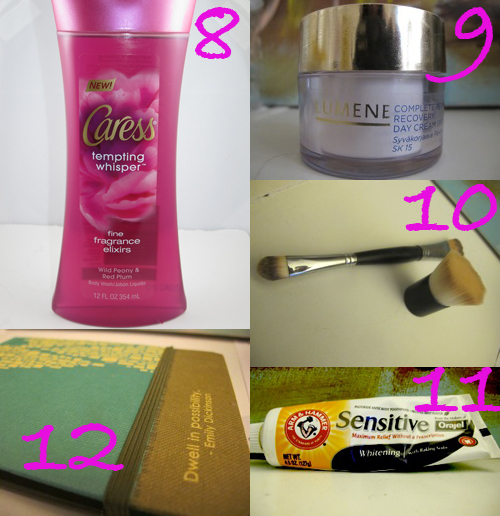 Arm & Hammer Sensitive Whitening with Orajel, $4. Is it weird to put toothpaste on this list? Considering I’m a dental hygiene freak, I think not. Last time I did this round-up I mentioned Rembrandt’s Deeply White Toothpaste which is amazing for whitening. People I’ve talked to seem somewhat polarized about Arm & Hammer’s toothpaste — seems like people either love it or cringe at the thought of baking soda in their toothpaste. Not sure what the deal is, but I find nothing offensive about its taste (is it just me?). It’s easy on teeth and gentle on enamel and removes surface stains for a distinctly whiter smile. 12. Reporter’s Journal. The cutest reporter’s journal my roomie, Shazia, got for me. Healthy reminders that I’m around good people. Anyway. Enough about me. What’s been getting you through this month? Beauty and the Feast: Beauty and products are a very openly discussed topic for women — do you think men are coming around with their skincare concerns? Dr. Allan Peterkin: I think men are more open to discussing grooming questions or concerns and using favorite products regularly now than before. In the past, most men were worried that paying attention to their appearance would be perceived as feminine, but now guys are more confident about grooming. Men today associate looking and feeling good with both personal and professional success. BATF: What are some of the most common skincare concerns for men? Dr. Peterkin: The most common skincare concerns for men include sensitive or irritated skin, looking tired, blocked pores or blemishes, and oily skin. BATF: What are some products every guy needs? Dr. Peterkin: Guys only need a few products to care for their skin, and certain brands like Dove Men+Care have made it easy for guys to maintain a quick, regular grooming routine. For example, their face range is designed to care for men’s skin in three easy steps: face wash (which removes dirt and oil but replenishes lost moisture), a good shave gel that will help protect from blade irritation, and face lotion or an alcohol-free post-shave balm (preferably with SPF). 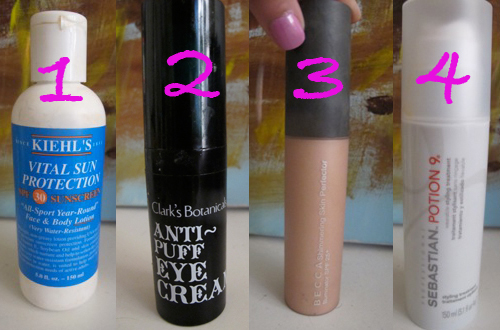 BATF: What is the best way to take care of skin during the summer? Dr. Peterkin: During the summer it’s likely you’ll be spending more time outdoors, which means SPF is a must. Many brands are creating 2-in-1 products that not only act as moisturizers, but also contain sun protection – I’d recommend guys try the Dove Men+Care Hydrate+ Face lotion, which has SPF built in. I’d also suggest wearing sunglasses and a hat to help prevent sun damage. Even if you have a beard, you need SPF! Finally, be sure to moisturize regularly and drink lots of water! Hydration both inside and out is crucial to maintaining healthy skin. BATF: What are the best ways to take care of skin/body if you’re physically active/sweating a lot? Dr. Peterkin: Sweating more frequently can lead to blocked pores and breakouts, so I’d recommend washing your face regularly in the morning, after workouts and before bed to remove the sweat, dirt and grime that may collect on your skin. If you are showering more often use products that won’t dry out your skin or strip it of its natural oils. 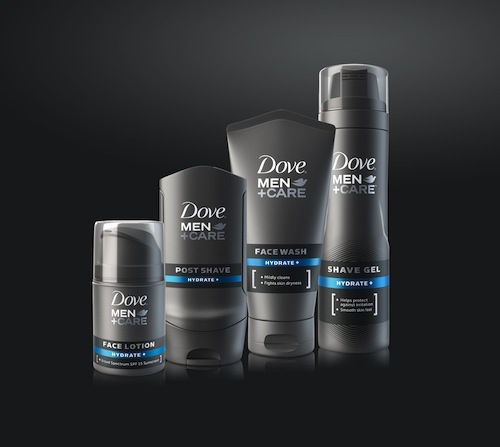 Dove Men+Care has a great variety of face and body wash products that have moisture built in, which will leave skin feeling clean, smooth and hydrated. Also, be sure to “cover up” if you’re heading outside for a workout. Sunscreen is a must but it can wash off. Adding a t-shirt or baseball cap to your workout as protection is best for that long bike ride or run on the beach. BATF: Let’s talk about facial hair. What are some of the more popular styles for men? BATF: What are the best ways to maintain a beard and keep it looking neat? Dr. Peterkin: I have a few tips: (1) Keep your facial hair in check by shaping the facial hair to give it a cleaner and sharper look; (2) When shaving, use a shave gel that moisturizes your skin and shave outside the natural growth, but not with too much precision that it eliminates the natural look; (3) Use pictures of yourself as a reference and create visual parameters – keep that in mind when shaving the perimeter on the upper cheek and at the neckline. You can also use your finger to make a boundary for the upper and lower part of your beard. Use short strokes with the razor, keeping the surrounding skin taut. Trimming facial hair is also key to maintaining a well groomed look – an electric clipper is helpful as it has a variety of adjustable attachments that you can choose from to trim the hairs to a specific length, but a pair of simple barber scissors will also do the trick. Uneven or rough areas or loose hairs can be refined once the initial shaping is complete. Finally. be sure to apply a non-irritant like Dove Men+Care Post Shave Balm to relieve any irritation and soothe the skin (it’s also a super beard conditioner!). BATF: Can you relay a couple “fun facts” about facial hair history? 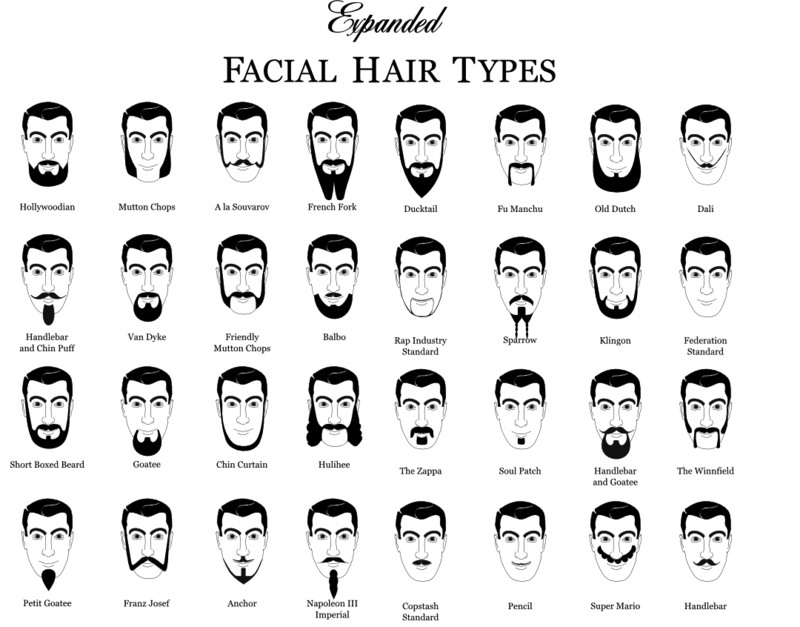 Dr. Peterkin: There are a ton of fun facts about facial hair history! For instance, beard hair grows 0.4mm every 24 hours, so most men can have a new style in 7-21 days…and a man will shave approximately 20,000 times over a lifetime! Dove Men+Care products are available at drugstores and range from $4.50-$7.50. “My morning routine starts with warm water and lemon,” Kerr says. “It really helps kickstart the digestion.” These gems, the recipe for her Ultimate Breakfast Smoothie, knowledge on ingredients (and all with still time to gawk at the gorgeousness) makes it a must see. Check it out below. Expectedly, the smoothie contains coconut water — the source Kerr has given longtime credit to for her glowing skin! 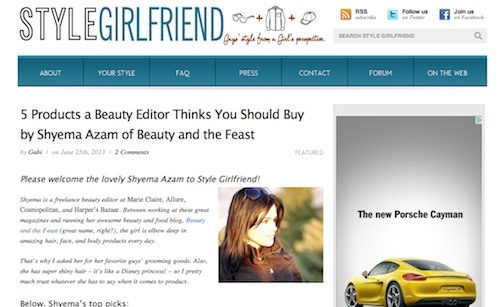 Hey all: I guest-blogged for the lovely Megan Collins (featured on Beauty on the Streets ) for her site, Style Girlfriend— a guys’ style blog from a female perspective. 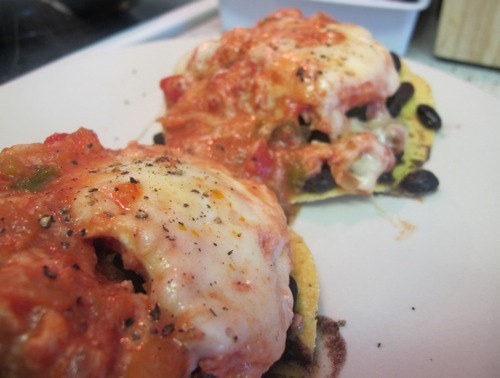 One of my favorite things to order when I go out for breakfast is Huevos Rancheros. Every restaurant I’ve been to has its own twist on the dish, which makes it a little more interesting to order. I always wanted to try making it myself at home. Recently at work, I came across a cookbook that had an easy enough recipe to follow. I thought it was a good place to start as a huevos-rancheros-at-home newbie. I kind of whipped this up out of memory because I didn’t have the book on me, but it actually turned out pretty great. 1. 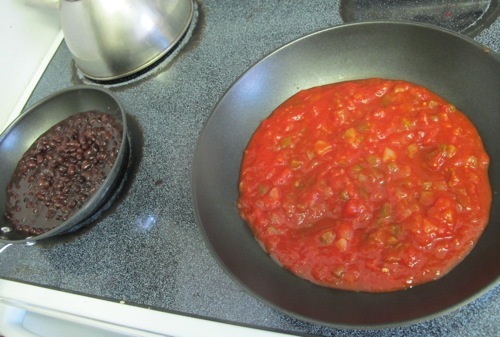 Empty the salsa and beans on separate non-stick frying pan and warm over medium heat simultaneously. 2. While the two are heating, start shredding the cheese. 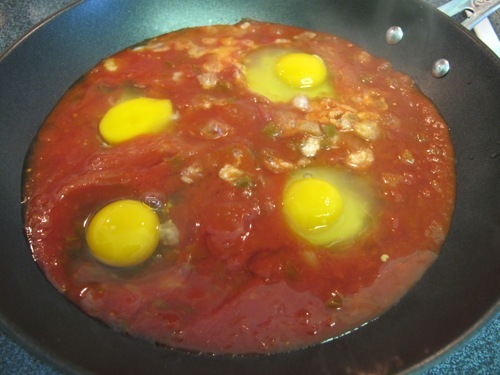 When the salsa starts boiling, it’s time to add the eggs. 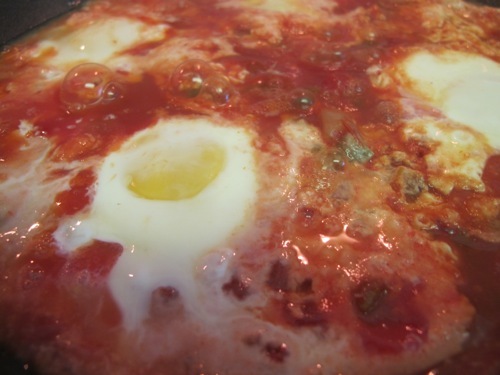 I like to make a little room with a wooden spoon in the salsa, and then I crack the egg right into the little space. If you’re cooking 4 eggs, crack one in each corner. 3. 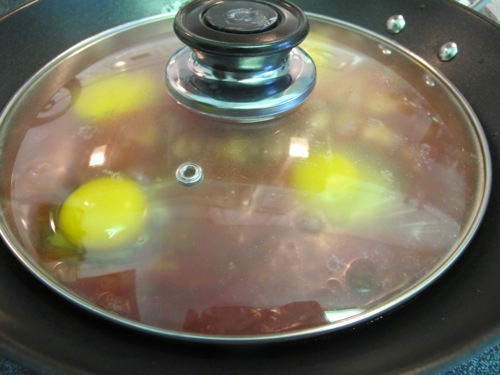 Now make sure you cover the eggs with a lid. Really important to cover it or else the top of the eggs won’t cook through properly. 4. 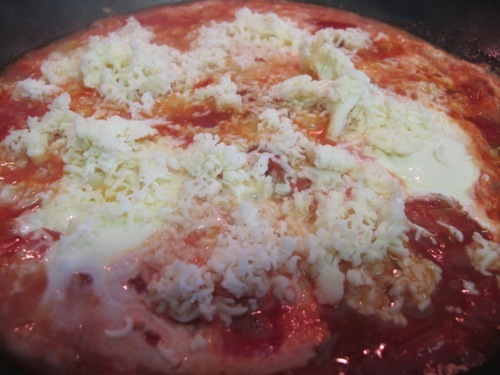 When the eggs firm up a bit, add the cheese, and cover again. 5. While the eggs are still cooking, lay the tostadas in a plate. 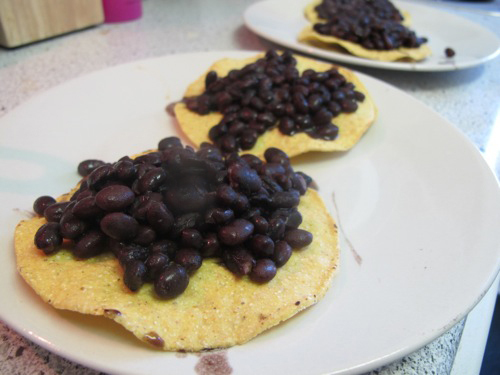 Take a large spoon to spread the cooked black beans over each tostada. 6. 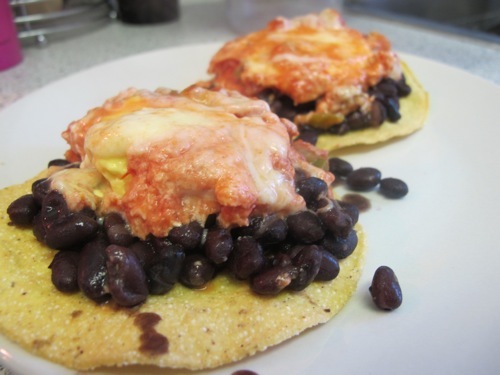 After the cheese is completely melted on the eggs, take a spatula to scoop up each egg, and lay it on top of the tostadas. Since they will be completely covered with cheese, you have to kind of just remember where each egg is placed, but they should be easy to scoop up since they should be thoroughly firm and cooked at this point. 7. Add a little pepper and salt, and serve. OPTIONAL: I serve with a side of chipotle corn that you can get at the grocery store. I first cook the corn, then whatever is left in the pan of the salsa/cheese mix, I’ll add the corn to that and serve on the side. Guacamole is also a good side to the dish. 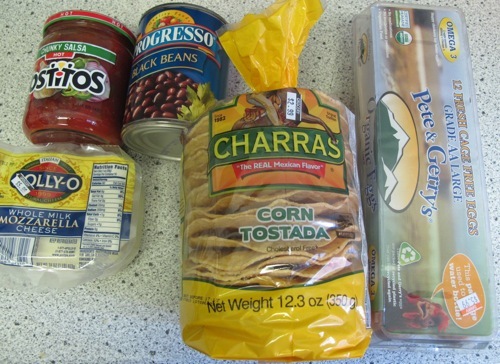 You can even mix the black beans and corn together and place on the tortilla before hand. It’s really up to you.